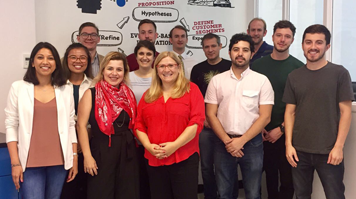 Four London South Bank University (LSBU) tenants and two graduate businesses have spent a week in incubators located in Downtown Toronto to see how easy it is to run their businesses from across the Atlantic. This is part of LSBU's ongoing partnership with Ryerson University and a newly established International Business Launchpad programme between the two universities. The pilot project will assess the benefits of operating from an International Launchpad in order to develop a model for UK and North American companies to access each other’s markets. For LSBU’s tenants and graduate entrepreneurs, there will also be opportunities to find new partners, access new markets and explore new investment prospects. The group started running their businesses within Toronto’s immersive start-up scene, using Ryerson’s landing zones as a base to network and make connections. Whilst in Toronto, they have compiled reports to evaluate their experiences of running a business overseas. “There are a lot of similarities between not only the two universities but also between London and Toronto. Given the current global and political challenges, we are keen to explore how the UK and North America, using this strong partnership between LSBU and Ryerson, can help start-ups and SMEs scale internationally. Ryerson University, like LSBU, provides opportunities for their students to work on real projects with real companies and start-ups. Operating within a 10-zone network covering different areas of industry, from biomedicine to design, students are offered the chance to learn new skills, gain experience and solve real world problems in Ryerson’s DMZ, ranked first in North America as the leading university-based incubator. LSBU will be hosting a return visit for four Canadian companies after which the results and evaluation will be used to shape the development of further International Launchpads with other university partners. Find out more about tenancy at LSBU.